Huge congratulations to Alfie Woods who was nominated by his clubmates as their rider of the year, in fact Alfie also bagged the coaches most improved rider for 2018 whilst George Gerrard snagged the committees riders rider. Well done boys, I wonder what the 2019 season has in store for you. There will be a Go-Ride for novice riders under the age of 16. We will be having a series in 2019. New to riding or just want to have a look come down and have fun. 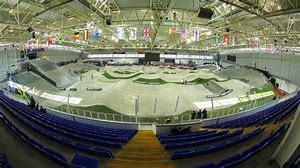 ​​Knowsley BMX Club have been able to book sessions in The National Cycling Centre BMX Arena, on Saturday nights from 5 till 7 for practice for the first race of the upcoming national BMX race series.